Our grandson, Gabriel, has been volunteering in his brother’s class at the suggestion of the teacher. When he first posted on Facebook that he was thinking about doing it, I was so excited for him because I know how rewarding doing something like that can be. I hoped he would decide to do it. He did. I thought about what ‘rewards’ mean to different people. I wondered what he would find rewarding about it as I thought about what I felt I would find rewarding about it. Besides that I love to be in the company of children, I know how rewarding it is to have a share in helping a child build a memory, conquer a fear of doing something, or learn a new task. Gabriel is getting to experience the rewards of what he is doing because he took the leap and did it. One of Gabriel’s rewards, as he has shared, is seeing the kids’ reactions to receiving and giving. What a wonderful thing to watch how a child reacts to something. He also gets to spend time with his brother in a whole different way. In the various aspects of our lives, we can be rewarded in so many ways – in our family lives, our friendships, our businesses; but we have to be willing to see the rewards. We have to look for the them. Seeing the rewards for our good work can be a great source of joy for us, which can help us to have a happy, thankful disposition. 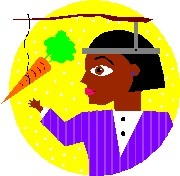 Then we begin to look forward to the reward, and it can become like the dangling carrot – something we pursue. So, reach out! Think about the ‘rewards’ that can come from certain things, and do it! Set the goals and rewards in front of you. That was about business. This is about health. Isn’t it amazing how they all interconnect? Sometimes in our personal lives we can take perceived ‘slights’ in a very personal way when it involves people we love dearly. Sometimes it is hard to take the good lessons that we are learning at work, or in our businesses, and apply them to our family and personal life. But we should. Because they do apply. Like this one. When we take things too personally at home, our feelings can get hurt. When that happens, misunderstandings can occur. When we have hurt feelings, it is hard for us to think clearly. It can even get to the point where we think that everything the person who we think did it or said it says, is directed to us as an attack — which may not be the case at all. Stop. Think. Take a moment. If we are living every day taking things too personally at home, it can begin to affect not only our relationships with our family members and friends, but also our physical health and our mental and emotional health. If we have a spiritual connection, it can affect that as well. Quit taking it personally. If we take it personally every time, it will be hard for us to move on and keep going. 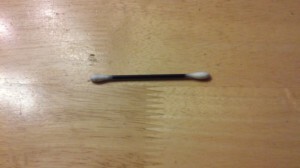 I keep the q-tip in my purse.